The plot targeted a gathering of the political affiliate of the Iranian opposition group MEK, the People's Mujahedin of Iran. WASHINGTON — U.S. officials have condemned Iran over a foiled bomb plot in Paris that France blames on Tehran, saying the attempt drove home why European governments need to impose more economic pressure on Tehran. On Tuesday, the French government officially and publicly blamed Iran's intelligence service for a failed attack on the June gathering of an Iranian opposition group outside Paris attended by thousands, including high-profile Americans like Rudolph Giuliani and Newt Gingrich. France said it had seized assets linked to Iran's intelligence services and two Iranian nationals — including one posted to the Iranian embassy in Vienna. John Bolton, President Donald Trump's national security adviser, welcomed France's response, saying, "What the French have done is exactly the right thing." "I hope it's a wake-up call across Europe to the nature of the regime and the threat that they pose," Bolton added. Bolton and the Trump administration have been at odds with European allies over how to approach Iran, with Washington arguing for an aggressive line backed by severe economic sanctions. Despite objections from Britain, France and Germany, Trump in May pulled the U.S. out of a 2015 nuclear agreement between Tehran and world powers. Bolton and other U.S. officials said the attempted bombing of the June rally, which occurred as Iranian President Hassan Rouhani was arriving in Switzerland on an official visit, reinforced the administration's rationale for a tougher policy. "This foiled plot demonstrates that Iran is actively threatening peace and security as the leading state sponsor of terror, not just across the Middle East but globally," said a State Department official who was not authorized to speak on the record. "In light of Iran's failed attack in Europe, it is all the more important that our European allies and all countries join us in holding Iran accountable for its dangerous and malign behavior, including by increasing economic pressure on Iran to deter such threats," the official said. The State Department last month named Iran as the leading state sponsor of terror in an annual report on global terrorism. The U.S. accuses Iran of backing militias that have targeted U.S. troops in Iraq. Iran, however, denies it is funding and arming terrorists in the Middle East or elsewhere. It is open about its support for Hezbollah and Hamas, which it says are not terror groups. Iranian Foreign Minister Mohammad Javad Zarif told NBC News in New York Wednesday that Iran is fighting terrorism, citing an Iranian missile attack launched against militants in eastern Syria in retaliation for an attack on a military parade in southern Iran. "We went into Syria to fight ISIS and other terrorist groups," said Zarif. "We're fighting ISIS and other terrorist groups in our region, so that we don't have to fight them in Iran. We've been victims of terror, including in Ahvaz 10 days ago." 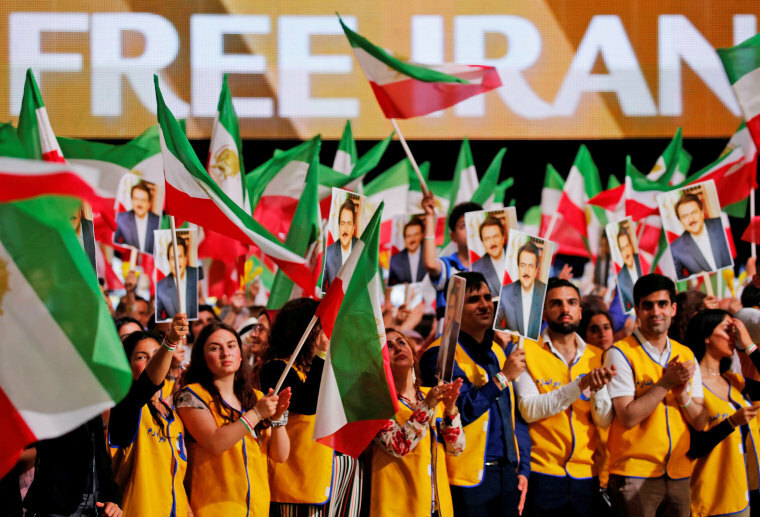 The June plot was meant to target a gathering of the National Council of Resistance of Iran, the political affiliate of MEK, the Mojahedin-e Khalq or "People's Mujahedin of Iran." The opposition group dates back to the 1960s and joined forces with Iraqi dictator Saddam Hussein during the Iran-Iraq war of the 1980s. Speakers at the event included Louis Freeh, a former director of the FBI; Giuliani, one of President Trump's lawyers; ex-House Speaker Gingrich; and Frances Townsend, former Homeland Security adviser under President George W. Bush. Former intelligence officers say Iran has previously gone to great lengths to target groups it believes are planning violence against the regime, even if it jeopardizes diplomatic overtures with the West. "They have a history of pulling out all the stops with the MEK and any group that is willing to use lethal force against them," said a former CIA officer with expertise on Iran. "They are merciless when it comes to those kinds of threats. So this is not a new thing." The French investigation was detailed and thorough, and authorities had no doubt that Iran's spy service was behind the planned attack, a French official told NBC News. Reuters first reported the French account. The plot was broken up through a joint effort by Belgian, German, Austrian and French authorities. Belgian police arrested a young couple, two Belgian nationals of Iranian descent, who were found with powerful explosives in their Mercedes and a detonator in a toiletry kit. German authorities, meanwhile, shut down a part of the autobahn to arrest Assadollah Asadi, an Iranian diplomat based at Iran's embassy in Austria, after the Austrians stripped him of his diplomatic immunity. The foiled plot coincided with Iranian President Rouhani's visit to Austria and Switzerland to try to drum up European support after the U.S. withdrew from a nuclear deal between Iran and world powers. Iran has vehemently denied the allegations and insisted it was an effort by the MEK to try to frame Tehran through a "false flag" operation. But two former U.S. intelligence officials with expertise on Iran say it's possible the operation was conducted with the support of the Iranian spy services and other hardline elements of the regime who are skeptical of Rouhani's diplomacy with the Europeans. France's seizure of assets focused on Asadi, the Iranian who was stripped of his diplomatic immunity and arrested by German authorities, and Saeid Hashemi Moghadam, the director general of Iran's intelligence service. A German court this week ruled the Iranian diplomat could be extradited to Belgium. The French said they would confiscate assets held by the Iranians linked to the failed attack, but it was unclear what, if any, assets the Iranian spies or other nationals held inside France. The case has aggravated tension between France and Iran, with Paris delaying the naming of a new ambassador to Tehran and withholding approval for Iranian diplomats due take up assignments in Paris. But so far, the case has not prompted France to reconsider its support for the nuclear agreement that imposed limits on Iran's nuclear program in exchange for relief from economic sanctions. France and other European governments are anxious not to undermine Iranian President Rouhani, a relative moderate who faces sharp criticism from hardliners in the regime who maintain his outreach to the West has been misguided. European officials say privately that the Trump administration's approach has undercut Rouhani and bolstered more radical voices in Tehran. A former U.S. intelligence officer questioned whether France's response was sufficiently severe given the gravity of the allegations. "I think you can make a pretty good case that the world has not punished Iran for its involvement in terrorism, other than sanctions on the individuals and some of the entities involved," he said. "The problem is that such a level of sanctions don't impact Iran's strategic decision-making." The Trump administration has issued a series of blunt warnings to Iran in recent months. Officials have cited what they said were threats from the Iranian government and Iran-backed militias in Iraq to a U.S. consulate in Basra, which was ordered closed last week. Last week, Bolton said the U.S. would not distinguish between the Iranian government and its proxies, and that any harm done to U.S. interests would be met with a forceful response. "If you cross us, our allies, or our partners; if you harm our citizens; if you continue to lie, cheat and deceive, yes, there will indeed be hell to pay," Bolton told a conference in New York. Ken Dilanian and Abigail Williams contributed.